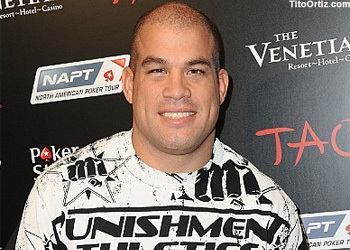 Tito Ortiz is one loss away from getting fired by the UFC, the MMA organization that helped make him famous over the last 14 years. According to “The Huntington Beach Bad Boy,” he’ll risk his employment status against light heavyweight Ryan Bader. While the 205-pounders didn’t confirm the when or the where, MMAWeekly reported on Monday the wrestlers will tango at UFC 132 on July 2nd. Ortiz was slated fight Antonio Rogerio Nogueira this weekend at “UFC Fight Night 24,” but the 36-year-old suffered a nasty cut in training and was forced to pull out at the last minute. Regardless, per Octagon president Dana White, this is a “must-win” for Mr. Jameson. Bader was last seen getting submitted by Jon Jones at UFC 126. “The Ultimate Fighter 8” winner was previously perfect through his first 12 professional bouts. The Mandalay Events Center in Las Vegas, Nevada is expected to play host.